Top-ranked Loyola overcame a 6-3 halftime deficit to lead 9-6 midway through the fourth quarter, then held off a fierce rally by No. 6 Oaks Christian to claim a 9-8 nonleague victory Tuesday, the Cubs’ second one-goal win over a highly-ranked LA team. The victory improved Loyola’s overall record to 6-3, but it was their second close call — they beat Palos Verdes in overtime March 10 — and third time in the last four games they have been held to single-digit scoring. Oaks Christian (5-2) lost for only the second time, both to Mission League teams currently ranked in the Top 10 of the US Lacrosse/MaxLaxLA coaches poll. The Lions lost to No. 5 Chaminade 10-5 on March 9. According to play-by-play provided by the @LoyolaLax feed on Twitter, the Cubs struck first and led 1-0 in the game’s first few minutes, but the Lions then held them scoreless the rest of the quarter. Meanwhile, Oaks pecked away at Loyola’s goal, building a 3-1 lead heading to the second quarter. With Aidan Hesse dominating at the face-off X — he won his first six face-offs and 19 of 21 overall — Loyola got back-to-back goals from Kaiser Fry and Hunter Ballard to tie the score 3-3 with 8:23 left in the half. Again, though, the patient Lions clamped down and chipped away. They scored three goals in the final 6:17 of the half to lead 6-3 at the break. But they wouldn’t score again until the last five minutes of the game. Speed Fry, who scored three goals to lead Loyola, opened the third quarter with a dodge down the right alley for a goal to make it 6-4. Robert Henderson followed suit 30 seconds later — after Hesse earned the Cubs yet another possession — to make it 6-5. A minute later, Speed Fry again dodged the right alley to tie the score 6-6 only two minutes into the second half. Goals from Henry Hasenberg, Hesse and Wes Priestly extended Loyola’s lead to 9-6 with 11:13 to play. 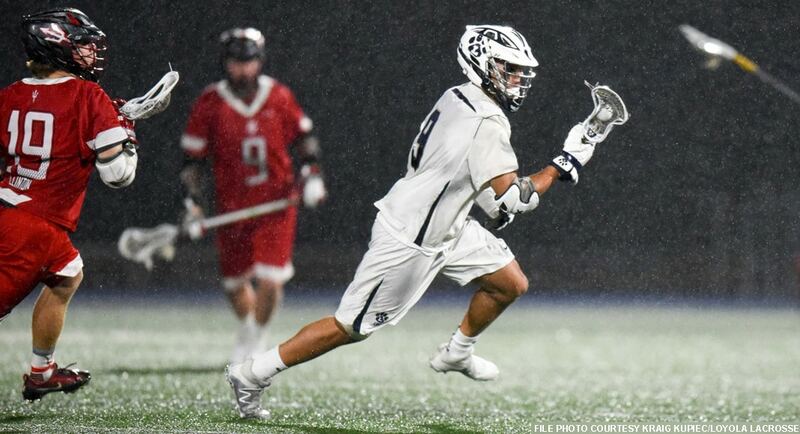 The Oaks offense, meanwhile, was quiet, with Hesse’s possession wins, Loyola’s defense and goalie Cam Beiler holding the Lions scoreless for 20 minutes, spanning from late in the third quarter to midway through the fourth. The Cubs killed off two Oaks extra-man opportunities in that span after surrendering two extra-man goals in the first half. The Lions finally broke through with 4:48 to play, making it 9-7. Then a steal and quick score pulled Oaks within one at 9-8 with 2:09 left. But Hesse won the ensuing face-off, and after a time out, the Cubs managed to run out the final two minutes to secure the win. Cort Rogers (3g, 1a), Cade Rogers (1g, 3a) and Mike Spaeth (2g) led the Lions’ offense, with Carson Campbell (1g), Nate Lenthall (1g) and Presley Regier (2a) also contributing.